This is a prime lens manufactured by Canon and the model was launched 2010. This lens has replaced several earlier versions and this lens is currently the newest version but please compare it with the earlier versions before you buy it. 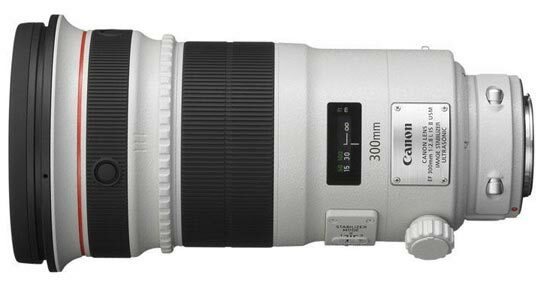 Text from Canon: "A worthy successor to the popular Canon EF 300mm f/2.8 IS, the all-new Canon EF 300mm f/2.8 IS II USM super telephoto lens is lightweight, weighing approximately 13% less than its predecessor, yet offers faster operation, improved image stabilization and superior optics. Incorporating Fluorite elements for improved image quality and reduced chromatic aberration plus a number of advanced coatings to minimize ghosting, flaring, and with a newly developed Fluorine coating that keeps soiling, smears and fingerprints to a minimum, the EF 300mm f/2.8 IS II USM is ready to deliver spectacular images in an instant. With a third Image Stabilization mode (Mode 3) that activates IS only when the shutter button is fully pressed, and giving the equivalent effect of a shutter speed four stops faster, the EF 300mm f/2.8 IS II USM allows for easy panning and is ideally positioned for professional action photography. The EF 300mm f/2.8 IS II USM also features a new security slot for wire-type security locks."